The Literature Production Centre (LPC) at Yirrkala School in Arnhem Land, Northern Territory, was the winner of the 2017 The Arthur Hamilton Award for Outstanding Contribution to Aboriginal and Torres Strait Islander Education.The Centre has been an integral part of the Aboriginalisation of Yirrkala Bilingual School since the inception of the program in 1973. Across the school the LPC co-ordinates the Yolŋu Indigenous Languages and Culture program including, Yolŋu Matha, Galtha Rom and Garma Maths. The Yolŋu Team Teachers, some of them graduates from the bilingual program, deliver the current Yolŋu Matha bilingual program through Dhuwaya, the first language of Yolŋu children at Yirrkala. 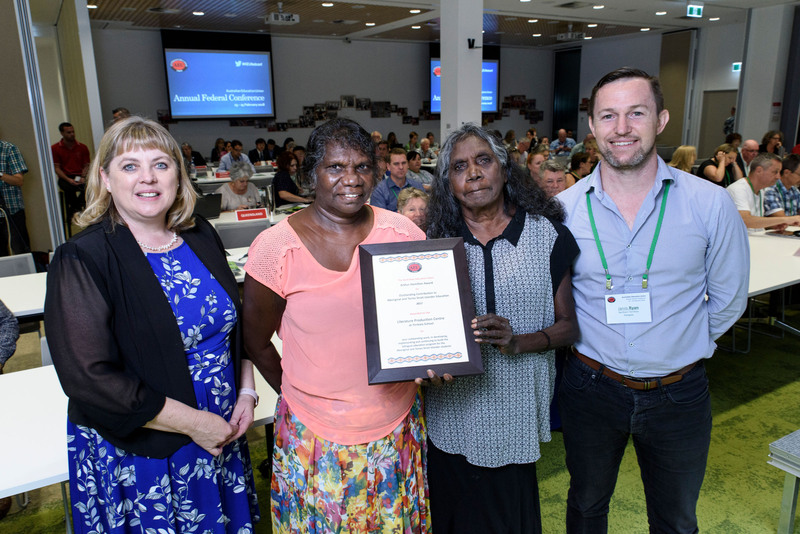 Culturally appropriate, bilingual education including programs like Galtha Rom, learning on Country and Garma Maths help to support students' sense of identity and wellbeing. By learning this way Yolŋu students can feel proud as they experience success and see that their identity, their languages and culture are valued. You can watch a documentary about the program here.